Argentine striker Sergio Aguero continued his awesome goalscoring record against Newcastle United after he scored a hattrick to lead Manchester City to a 3-1 home win against the Magpies in their week 24 league clash on Saturday night. The former Atletico Madrid striker gave City a first half lead before adding a second from the spot after the interval. 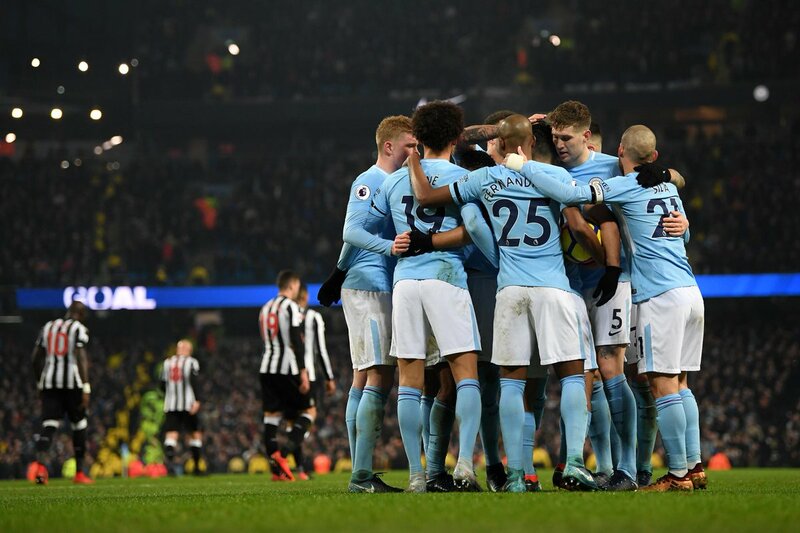 Jacob Murphy pulled one back for Newcastle United to set up a nervy finale but the aforementioned Aguero settled City nerves with his hattrick goal off an assist from the impressive Leroy Sane just before the final whistle. Aguero has now scored 14 goals in 12 appearances against Newcastle United. The win takes league leaders Manchester City twelve points clear of nearest challengers and city rivals Manchester United who had earlier cut the deficit to nine points with a slim 1-0 win at Burnley courtesy in-form French striker Anthony Martial. Champions had earlier leapfrogged Liverpool into third spot after a comfortable 4-0 win at Brighton with the goals coming from Eden Hazard (2), Willian and Victor Moses.